Mr. Kelly obtained a zero verdict at trial for Peoria School District #150, after receiving a demand for life time benefits prior to trial and total medical expenses incurred were over $250,000. Mr. Kelly obtains a trial verdict of zero for the School District. Mr. Carlton sought life time benefits at trial against the School District. Stephen represented Peoria School District trial verdict of zero, establishing that Ms. Krus claim for multiple injuries and claim for significant monies, denied. 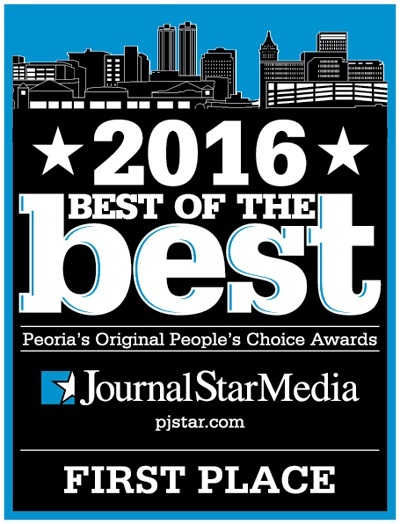 Stephen Kelly Law voted BEST LAW FIRM at the Journal Star's 2016 Best of the Best Business Awards Ceremony! Thank you to everyone who voted us #1! Appellate Court verdict, finding officers Needham's cubital tunnel syndrome related to his work activities as a police officer. Stephen represented Unity Point, in a zero award from the Appellate Court, on issue as to whether the alleged repetitive trauma claimed by Ms. Hagaman was work related, or not. A win for a bus driver, awarding surgery for carpal tunnel syndrome. Verway v Bomag Americas Inc.
A finding that Mr. Verway, was permanently and totally unable to return to work, resulting in a letter Settlement over $300,000. Stephen represented Peoria County, and obtained a zero verdict on whether the fall sustained by Ms. Carter was work related, or not.